The 31 year-old victim of an anti-Semitic stabbing attack in Antwerp was released from hospital late Saturday night - and is now speaking to the media about his brush with death. Yehoshua Malik, a Belz hassid, was walking to a local synagogue in the city's Jewish Quarter when he was attacked. "At about 9:00, I was on the way to synagogue," Malik recounted to Walla! News Sunday. "It all happened suddenly, in a moment. A man wearing a hoodie tried to stab me in the chest, near my heart. I resisted with all my might, and fortunately he was unsuccessful, because I was wearing a thick bekishe (jacket - ed.)." "He kept trying to stab me in places that were visible, like my neck," he continued. "I was shocked. I shouted for help, I tried to stop him. People came to see [what was going on] and then he ran." "At that moment I remembered the recent events in Israel, the terror attack [in Tel Aviv - ed. ]," he added. "It's scary, but I will not be daunted by this and I will get over my fear." Malik's brother said that the entire family is anxious for the perpetrator to be arrested - and implied that it may have been a neo-Nazi who attacked Malik. "He said it was someone with light coloring, not someone who looks Arab," Malik's brother said. "It is unclear what his motive was, but we hope that the security cameras in the Jewish neighborhoods will help the Federal Police solve this quickly." Malik's brother dismissed rumors of heightened anti-Semitism in general in Antwerp, however. "In Antwerp, there are not many big incidents against Jews, and no sense of danger or fear," he said. "You can walk around in the streets, this is just like other small incidents in the country that don't affect your daily life." 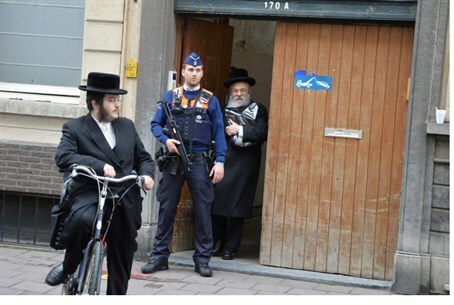 Rabbi Abraham Gigi, Chief Rabbi of Belgium and representative for the Conference of European Rabbis, also turned to the police demanding an investigation and said that as far as he knows, the attacker is likely to be of Polish origin. He said investigators are examining the security cameras near the scene.